Since 1974 SYN-FAB® has specialized in the design, manufacture and service of high temperature and industrial CCTV and imaging systems. The real-time images produced by our high temperature camera systems can be used as a tool to improve efficiency, reduce emissions, minimize fuel consumption, troubleshoot problems, aid in start-ups, and improve safety margins. Adding the integrated ability to accurately measure boiler, kiln, or furnace process temperature to the video capabilities of the imaging system greatly expands the utility of this technology. All of our equipment is supported 24/7 by our knowledgeable and experienced staff. 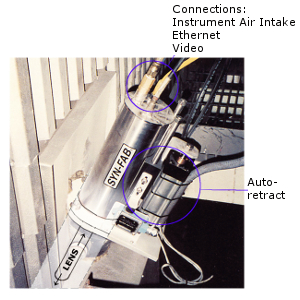 The SYN-FAB® SF12MP series imaging system represents the state-of-the-art in high temperature process monitoring. Each system utilizes a high-tech combination of electronics, optics and protection to produce high quality, reliable video and temperature data of your process. The SF12MP’s optical system is optimized for imaging in the mid-wave infrared spectrum to see through the smoke, ash and haze produced within even the most volatile boilers and furnaces. SF11 series imaging systems utilize the same high temperature enclosures and cameras as our SF12series, but each SF11 series system is available with a 3” or 12” furnace lens that has an adjustable field of view.The SF11C is fitted with a color camera and is typically mounted at grate level in power boilers or other areas thatdo not have refractory wall thickness exceeding 8”. The SF11SP is a special version of the SF11 that is typicallyused to monitor carryover in upper furnace areas and is fitted with an IR camera. SF30TI is a ruggedized, weatherproof infrared imaging system for industrial process monitoring. Eachsystem utilizes one of our machined STEELON™ enclosures to provide IP66 protection for a state of the art,infrared camera and lens assembly. The color thermograph and temperature information can be displayed on colormonitors that accept industry standard NTSC video inputs or PCs via Ethernet. Pyro-Viper™ HD is a PC based temperature and image processing system designed for use with SYN-FAB® high temperature radiometric cameras. Functionality includes the ability to observe live process conditions and obtain a color thermograph of the process interior, while simultaneously monitoring thetemperature of unlimited areas of interest and comparing to operational parameters of the process. I/O options include a standard network interface, optically isolated 4-20 mA outputs, and/or OPC connectivity. Contact us for details. 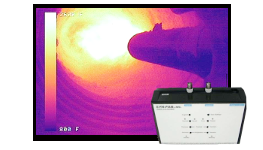 Thermal Analyzer III transforms your SF12 series infrared system into a visual pyrometer. TAIII is a black box image processor that calculates, displays, and outputs the temperature of each target defined by the user. Each temperature represents the average surface temperature of the target area defined within the field of view of theinfrared imaging system. Contact us for details. Spectrum™ TG used with the SF12 series infrared imagingsystem displays a high resolution video of the target with a color thermograph overlay. Spectrum™ TG is a black box image processor that will economically transform your infrared imaging system into a calibrated imaging pyrometer.A raw infrared image is composed of a gray scale. Each level of this gray scalecorresponds to a very small temperature band to which the SPECTRUM™ TG assigns a color. The image can thenbe displayed as a color thermograph instead of a gray scale image. Contact us for details.